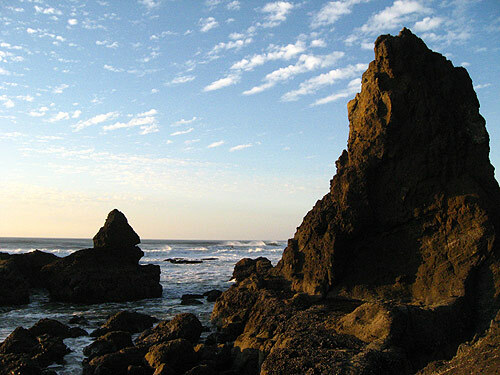 At the very northern end of Lincoln City, up against a bluff that neighbors Cascade Head, there's a stretch of beach beneath a bundle of lovely homes - often vacation rentals which look over the strand. The northernmost access lies up the street. This spot allows for perhaps two cars to park there and is approximately half a mile from the looming cliff. 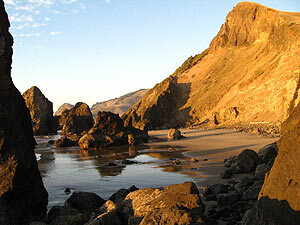 The cliff, across the Salmon River from Cascade Head, possesses the rock structure known as Wizard Rock. At anything but a high tide, this moody, slightly spooky, pointed rock can be seen. 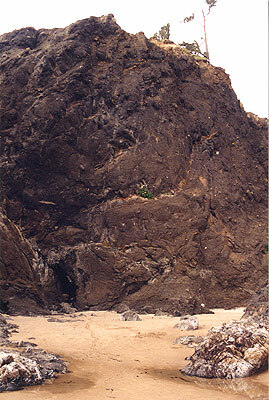 But at a low tide, you can go around Wizard Rock and find a rarely touched section of beach, filled with small caves, pristine, glistening sand and inviting, angular rock forms and haystacks to climb and carouse on (pictured here).